In my best Elvis voice, I’d say there is a whole lot of thanking going on. And for good reason, without an audience blogging would lose a big part of its appeal. I love to write, but truth is I crave to be read. So to my readers, thank you. Thank you very much. If you write a post in the forest and nobody reads it, is it really a post? Okay, I took it too far. 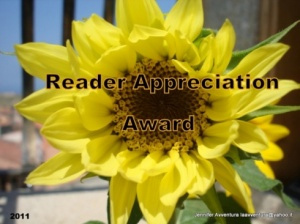 I’m absolutely thrilled that Wanton Creation nominated me for the Reader Appreciation Award. If you haven’t read Wanton Creation, you are probably in that terus nullius where posts don’t make sounds. Hahaha, I laughed at the post in the forest line. Very good! Thanks for the nomination! I am currently going through my final content revision on my novel, and it is work, not nearly as much fun as dreaming it up. I’ll actually be writing a bit about that part of the process in the near future. As for the Kings, I have been a lifelong hockey fan (Red Wings). Last year I looked carefully at LA and told everyone they would win the cup this season. Great team, I am enjoying their rise to excellence. Good luck!